Serenity Water Gardens has been building sophisticated, high-end water features for over twenty years. When they were ready for a website update, they approached us for help. Owners Greg and James have opposite tastes in layout styles, so it was a fun and intriguing journey to create a site that reflected both of their expectations. In 2009, Worpress was still primarily a blogging platform, and did not have the flexibility for site development. We decided to go with CMS Made Simple because we wanted them to be able to manage the website and update content using a word processor style interface. In early 2013, we created a new Serenity site built on the highly evolved WordPress CMS. 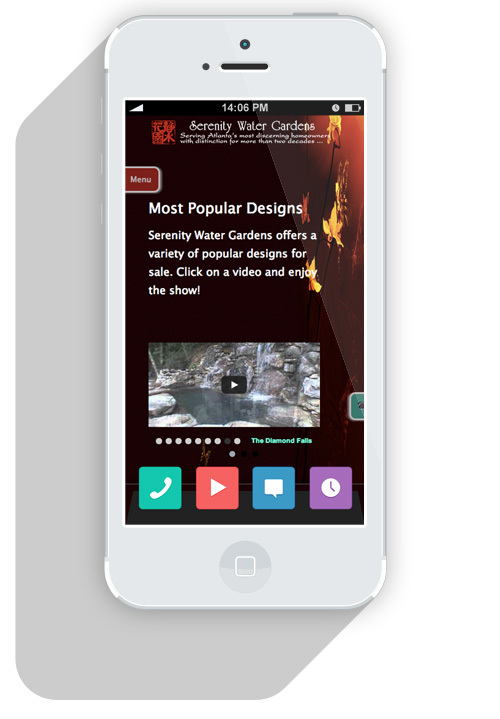 We went with a responsive website design so the experience would resize elegantly for cell phone and tablet users. Fortunately, the owners had documented their entire body of work. We went through years of archival footage and began assembling a site that reflects the diversity of their work. Prospective clients can make inquiries and schedule appointments through online forms. Our goal was to make the user experience as simple and enjoyable as possible. Based on the feedback we’ve been getting, our mission has been accomplished! © 2019 360 Digital Media.